Libby's Little Addiction: Vive le Tour! For three weeks now I've been thinking "Hmm, I really should make a Tour de France inspired card!" and today I finally did it. On the very last day of the Tour! If you've been with me for a while, you know that I'm a bit of a fanatic, although I'm not sure I've actually said anything about it on here yet this summer!? My husband is a bigtime sports fan, he'll watch pretty much anything! Back in the summer of 1999 he tuned into a bike race and told me a guy from Austin was riding, and he was a cancer survivor and used to ride for Motorola - the company we were both working for at the time. Actually, back then there were photos in the lobby at work of some guys on bikes, but I had never really thought much about them. But I was intrigued by this story. So I watched it with him. AND LOVED IT!! And of course I went on to watch Lance Armstrong win seven consecutive Tours! The man is completely amazing, I believe the greatest athlete of our time. 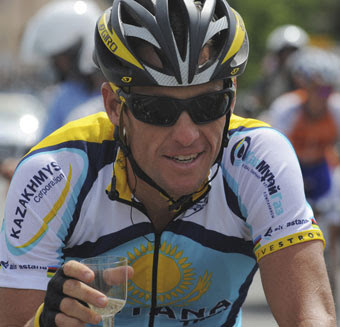 Some speculate he's doped - the sport has been plagued by many scandals - but I choose to believe he's clean. He's just super human. :-) After his 7th win in 2005 he decided to retire, and I was very, very sad. I watched the next three summers, and though I still loved it, it just wasn't the same (plus more doping scandals left me very frustrated with the whole thing!). And then - Joel told me (he's the one who actually reads the sports page, not me!) - Lance was going to make a comeback this year!!! He wanted to ride again to continue to raise awareness for his foundation, which provides tremendous support for people battling cancer, encouraging them to LIVESTRONG. I tried not to get my hopes up too much - three summers off from the Tour, and now riding against some really great younger riders (Lance is the same age as me - an old fart in cycling!!) - but then the Tour happened and Lance was amazing and *sigh* all was right in the world once again! It was tough not seeing him in yellow this year, the color of the race leader, but fighting his way to a 3rd place podium position in Paris, while also showing great sportsmanship and working hard for his teammates - AMAZING! As his team shared on Twitter: "Congrats to Lance for 3rd in his amazing comeback to cycling. He's shown athletes & the world what a true champion he is." So the way I celebrate such happy things? Why, making a card of course! This is more of a Lance-inspired card than a TDF-inspired card. Lance has worn an awful lot of yellow in his lifetime!! I used the "inspire" definition from the Stampin' Up set "Define Your Life" - because he does indeed inspire me - it's stamped very subtly with Versamark. I think of roses when I think of Lance - one of his fundraising events is called Ride for the Roses - so I used Fifth Avenue Floral, again very subtle on Kraft paper. I stamped the roses in Summer Sun then watercolored them in with very watery lid ink. I created the "be strong" sentiment with my Karen Foster snap stamps. Another thing I love about the Tour de France is getting to spend my July living vicariously through the cyclists riding across the beautiful French countryside. We were lucky enough to visit France back in October of 2003. I have a dream of *someday* watching a mountain stage of the Tour in the Alps! 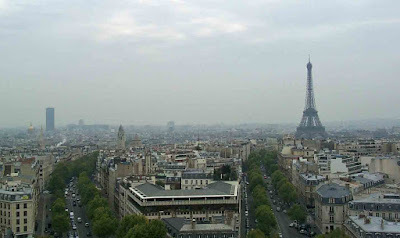 But here is a photo from Paris - the view from atop the Arc de Triomphe. Oh how I wish I was in Paris today!! Thanks for indulging me if you read this entire post (! ), and thanks as always for stopping by! Wow, that's a pretty one. Are you going to send it to Lance now? Libby that is a fabulous card!! And thanks for telling the story of how you grew to love Lance! I love him for other reasons, but could never put it into a great story form like you did. I enjoyed reading it!! My husband is a testicular cancer survivor (like Lance) so we've followed his career, too and he continues to inspire us and make us feel stronger with each and every accomplishment he achieves (either on his bike or through his foundation work). Thank you for a very special post today and like Mariam said...I think you should send this card to him (maybe with a copy of your blog entry, too)! What a great story behind the card. My brother and I were saying we'd like to see a portion in the mountains one time because we're pretty sure everyone along the road has been drinking ALL day. Love your card! I too was rooting for Lance to win again. Although taking third is too bad after a 3 1/2 year layoff and his "ancient" age. Always love reading your blog. Ta! Great card...love it! I think it is wonderful that Lance did the right thing and played as a teammate so Contador would (and should)win. Lance did have some absolutely remarkable race days though and as someone a little older than he is I can't imagine being on a bike for that long! Not only inspired, but beautiful, Libby! 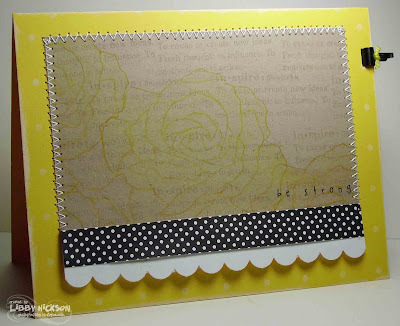 I love the yellow and black, the clean and simple design, and, of course, the polka dots! Very pretty card. I love the subtleness of the flower on the kraft and the ribbon & stitching makes it all come together very nicely. Your Tour de France inspired card is so pretty, Libby! !